This tender book celebrates the beautiful relationship of parents with their children. I love the reminder of the incredible change and blessing children bring into our lives. In the busy-ness and frustrations of the day, it it too easy to lose sight of this. But my children have added so much depth to my life, and I always want to appreciate this change as the blessing it truly is. 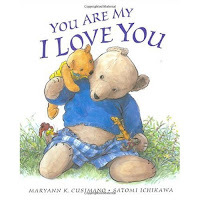 Check out more wonderful books for your kids on Feed Me Books Friday, hosted by The Adventure of Motherhood. What?! no comments? This sounds like a wonderful book. I guess all the mommies are getting ready for their big day. I love the contrast of the poem, and it so different from most mommy poems. Glad you are counting your blessings about being a mommy-me too!